I love Faeria, a weird mix of strategy, card game, and a board game all in one. It's like Hearthstone on steroids, and it now has a cheaper option to be able to play it right now. You can officially get it on Steam for £5.99 without any booster packs, as opposed to the £17.99 bundle. This is great news, as the game is awesome and now more people can join in. They still plan to make it free to play after release. You can see my previous thoughts on Faeria here. 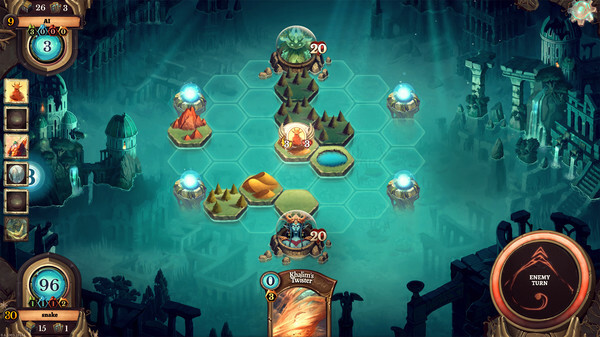 Faeria combines the core values of Strategy Card Games together with a Living Board, giving you the ability to shape the board as you play to create mind-blowing strategies. Each game of Faeria is not only unique, beautiful and fast-paced but also highly competitive. From what I've heard, the game is planned for a f2p release on september, right? People that like that kind of games can also check Duelyst: there's no Linux client (yet) but the web version runs pretty well with Google Chrome (haven't checked Firefox or Chromium). And it's f2p. Hmmm...the Steam store page only lists Windows and Mac...I have a newish Windows laptop now upon which I cannot install Linux. Yet. It looks great, but I won't buy it for Windows if I can buy it for Linux. oldrocker99 Hmmm...the Steam store page only lists Windows and Mac...I have a newish Windows laptop now upon which I cannot install Linux. Yet. It looks great, but I won't buy it for Windows if I can buy it for Linux. let me guess: uefi + secure boot....? Yup. I altered some stuff in the BIOS and lost Windows entirely and I won't miss it, either . In a world of freedom, who needs windows or gates? Which Distro are you using? Im using Manjaro and im very happy. But one never knows. Maybe there is even a better one out there . I'm using Ubuntu MATE 16.04 beta and I'm happy. I tried Manjaro, and liked it, but there were several Steam games that didn't like it, so I went back to Ubuntu MATE. The game, by the way, installs just fine and is a pretty awesome game, too.